As we increase our research efforts in bargain hunting, we notice that a bear market creates many excellent investment opportunities. In the midst of a down market, Sesen Bio’s shares are trading in the deep south. And yet, the company is undergoing many positive fundamental developments. The lead molecule Viccinium is being innovated as a potential treatment for non-muscle invasive bladder cancer, as an alternative to a bladder removal. Back in May, Sesen presented the excellent 3-month interim data of Vicinium in the Phase 3 VISTA trial. Nevertheless, the market misinterpreted the findings. Looking ahead, our analysis revealed that Viccinium should deliver the excellent 6-month clinical outcomes. The market and therapeutic demand for Viccinium is substantial. Fear is one of the most powerful human emotions because we tend to be most responsive to fear. Notwithstanding, fear can make an investor make an irrational decision. That’s what happening to Sesen Bio (NASDAQ:SESN), a small-cap immuno-oncology innovator seeking to fill unmet medical needs in the bladder cancer market. The company has a stellar drug, Viccinium a strong candidate to treat resistant non-muscle invasive bladder cancer. The interim 3-month data of the ongoing Phase 3 VISTA trial studying Viccinium was excellent. Nonetheless, the stock tumbled due to the market misinterpretation and inefficiency. Interestingly, Sesen is reporting the 6-month data in less than four weeks. Our analysis revealed that the clinical outcomes will be strongly favorable. In the midst of a bear market, Sesen presents itself at a deep discount. In this research, we’ll present an analysis of the upcoming clinical binary of Sesen and reaffirm our bull thesis on this highly promising company. As usual, we’ll provide a brief overview of the company for new investors. If you are already familiar with the firm, we recommend that you skip to the subsequent section. Sesen is headquartered in the medical innovation hub (Cambridge MA). With the emphasis on the development and commercialization of advanced medicines to treat various cancers, Sesen is powering Targeted Protein Therapeutic which is similar to the validated antibody-drug conjugate. As shown in Figure 3, the lead molecule Vicinium is being assessed in the Phase 3 VISTA trial as a potential treatment of bacillus Calmette-Guérin (“BCG”) refractory high-grade non-muscle invasive bladder cancer (“NMIBC”). As mentioned, Sesen recently reported the strong interim data for Vicinium. There was a 42% complete response rate for the carcinoma in situ group at the 3-month interim analysis. The most interesting development is the combination of Vicinium and durvalumab (Imfinzi) of AstraZeneca (NYSE:AZN), currently in its Phase 1 trial for the same indication. In our opinion, combination therapy leads to improved clinical outcomes due to the less time that it has for cancer cells to evolve to escape immune detection and thus, preventing treatment relapses. As an earnings report reveals many important developments, we’ll analyze the Third Quarter earnings for the period that ended on Sep. 30. As follows, there is no revenue recorded for the quarter because Sesen is a developmental-stage bioscience company without an approved product. We believe that research and development (R&D) is highly important to the growth of a company like Sesen. Therefore, we’ll take a look at the R&D spending. Notably, the R&D expenses for the respective periods came in at $3.4M and $3.6M. The slightly lower spending is related to the reduction in Vicinium developmental expenses. The overall R&D stays pretty much the same, as it’s strategic for Sesen to conserve cash by initially focusing on the most promising development. 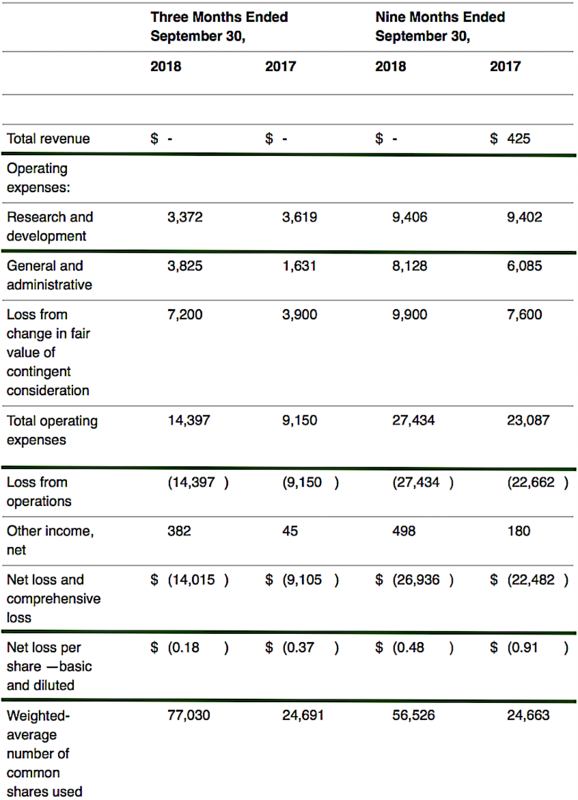 Additionally, the company posted the $14.0M ($0.18 per share) net loss compared to the $9.1M ($0.37 per share) decline for the similar period. This represents a 54% bottom line depreciation. And, we expect more losses going forward because it takes more money to clinically advance Viccinium/Imfinzi. Pertaining to the balance sheet, there was $57.9M in cash and cash equivalents and thereby signifies a 412% improvement from the $11.3M. Based on the $14.3M quarterly burn rate, there should be adequate capital to fund operations for another year prior to the need for additional financing. Nevertheless, it is likely that the company will strategically raise cash three quarters from now or whenever the stock is trading high enough to further strengthen the cash position. Earnings aside, it is important for investors to keep tab of ongoing corporate developments in order to know what to expect from your stock. The most important event is the upcoming reporting for the interim (6-month) data of VISTA. Interestingly, this is an unexpected surprise because the company did not plan to initially publish the 6-month data. In our opinion, when a firm decides to report the clinical outcomes ahead of time, the results are usually excellent. And, we view this as a hugely positive sign. The other notable catalyst is a presentation that Sesen conducted back in September. It shows that all patient samples in VISTA expressed the EpCAM molecular target of Vicinium which improves its chances of trial success. Moreover, Sesen recently entered into a manufacturing agreement with Fujifilm Diosynth Biotechnologies for Vicinium supply. Therefore, the partnership ensures an adequate Vicinium supply for VISTA for trial development as well as commercialization. Sesen published the interim data for VISTA (back on May 21, 2018). In June 2018, the National Cancer Institute (“NCI”) initiated patient dosing in Phase 1 trial of Vicinium/Imfinzi. The NCI Cooperative Research and Development Agreement was executed in June 2017. In June 2018, Sesen Bio completed a public offering of its common stock, thus raising $46M in gross proceeds. In August, the FDA granted Fast Track designation to Vicinium for NMIBC treatment. In September, Sesen presented a biomarker update for VISTA which shows that all screened patient samples expressed the EpCAM molecular target of Vicinium. In October, the company inked an agreement with Fujifilm for the manufacturing of Vicinium supply. VISTA is expected to complete in March 2019. The six-month data will be reported in December 2018. The one-year outcome will be published in mid-2019. The Phase 1 trial of Vicinium/Imfinzi has the estimated primary completion and study completion dates on July 01, 2020, and July 01, 2021, respectively. As the upcoming 6-month data reporting for VISTA is a critical determinant of Sesen’s value, we’ll conduct a clinical forecasting for the aforesaid franchise. Leveraging our Integrated BioSci framework of “molecule analysis” - that took into accounts different scoring variables, including available trial data (“TDV”), comparative molecular analysis (“CMV”), structural design (“SDV”), clinical trial setups (“TSV”), and disease specificity (DSV) - we prognosticated that there are correspondingly over 70% that Vicinium will procure positive outcomes in VISTA, thereby indicating the “strongly favorable” reporting. TDV and DSV factored substantially into this data forecast. In specific, the 3-month interim analysis showed a robust 42% response rate for carcinoma in situ. Therefore, it is reasonable to expect similar results for the 6-month reporting. It is also important to note that a 42% response rate is excellent for approval because the alternative option is a complete bladder removal. We believe that most patients would prefer a drug with good efficacy over getting an essential organ cut out. In addition, the high expression of EpCAM (the molecular target of Vicinium) on patients in VISTA improves its chances of success. For qualitative analysis, an antibody-drug conjugate (i.e. Vicinium) is novel yet not as exotic as a CAR-T or gene therapy. Hence, we graded its scientific novelty as only high. Due to the fact that the sole option for NMBIC is a bladder removal, there is an extremely high unmet medical need. The stellar FDA Commissioner (Dr. Scott Gottlieb) also lowered the regulatory hurdles to enable an unprecedented delivery of life-saving therapeutics to patients which should help out Vicinium. Taken altogether, Vicinium should be able to enjoy the extremely high ease of regulatory approval. A key part of our analysis is a market estimate for a drug. Even when a drug is excellent, its development can be unfruitful to the company if there is little to no market. According to Dr. Cai Xuan from GlobalData, the bladder cancer market is dominated by the U.S., France, Germany, Italy, Spain, U.K., and Japan. Growing at the 12.5% CAGR, Dr. Xuan estimated that this market will triple in size from $360M in 2015 to $1.17B by 2025. In our view, the best candidate for NMIBC is the combination therapy of Vicinium plus Imfinzi. 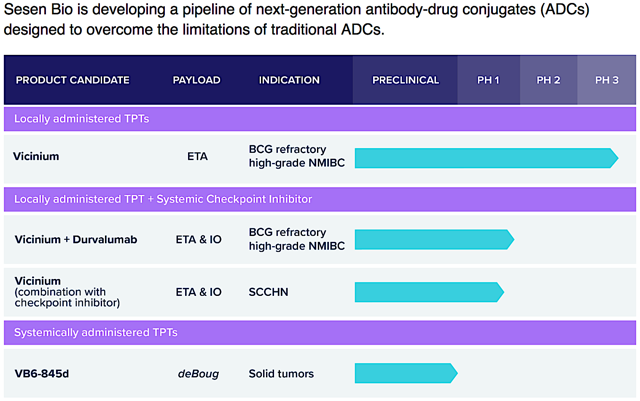 Combination therapy is an excellent approach to fuel the growth for the oncology market. Based on the 42% response rate, Vicinium alone already trumped anti-PD-1. With Vicinium plus Imfinzi, we expect the overall response rate to be synergized to approximately 70%. Due to the stellar clinical data that we anticipated, we forecasted that Viccinium will be able to capture at least 50% of the market shares which equates to $585M. Asides from Vicinium monotherapy, its combination with Imfinzi will most likely dominate this market. Warren Buffett stated that two excellent analysts can assess the same company (and came up with distinct figures). Hence, one should take valuation within its appropriate context. To minimize subjectivity, we employed the comparative market analytical method (of gauging similar firms to give investors a rough estimate of an investment’s value). We usually check the Wall Street analysts consensus to get the market sentiment on a particular stock. 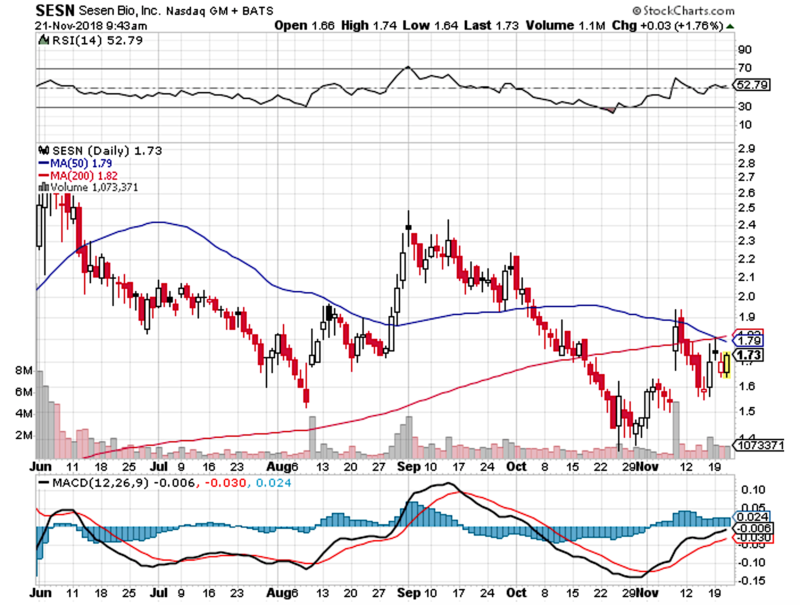 That said, Wall Street put the $3.5 price target (“PT”) on Sesen. In the next step, we’ll appraise Sesen based on our estimated potential sales for Vicinium and Vicinium/Imfinzi for NMIBC. And, we’ll take into account the 10 price to earnings (P/E) ratio, 70.0M shares outstanding, 25% profit margin, 25% discount for clinical trial risks, and 43% discount on the potential dilution. Of note, we discounted this franchise by 25% to match its highly favorable chances of success. And, our discount for dilution is based on the 43% estimated rate for the past 3-years. We added the dilution factor because the shares outstanding are expected to increase over time. Viewing the big picture, the stellar quality of Vicinium and Vicinium/Imfinzi should enable the drugs to capture from $250M to $585M out of the $1.17B market. In the final step, we averaged all PTs and thereby arrived at $6.36. Our PT is slightly higher than Wall Street and represents a 274% upside from the current $1.7 market quotation. The actual PT can be higher due to the other molecules in development: our valuation is solely based on the most advanced franchise NMIBC. For a small bioscience firm, the primary risk is whether the lead molecule will pass its clinical trial. If the drug fails to post positive data, the stock can tumble over 50% and vice versa. With that being said, there are correspondingly 30% chances of a negative clinical binary for Vicinium. For Vicinium/Imfinzi, the binary risk is lower at only 25% due to the greater chances of success. In a bear market, it is common to observe investors “selling the news” on a good data reporting. And even if the aforesaid medicines will be approved, they might not generate substantial sales due to market competition and other unforeseen variables. In all, we maintain our strong buy recommendation on Sesen Bio with the four out of five stars rating. And, we raised the $6.0 price target (“PT”) to $6.36 to be most representative of our updated calculation. We expect this PT to be reached within one to two years as Viccinium matures into an FDA approval and its commercialization phase. One might argue that a 42% response rate for the 3-month data reporting is not robust. Nevertheless, the aforesaid finding is highly favorable in its appropriate medical context. In other words, the only other option to Vicinium/Imfinzi is a bladder removal for NMBIC. Given that the market for NMIBC is $1.17B and Viccinium is positioned to dominate this market, Sesen can become a highly profitable investment at the turn of the next bull market cycle. Nevertheless, investors might not have to wait that long. There are two upcoming catalysts that can galvanize the stock to break the bear market downtrend. The first event is the upcoming 6-month data reporting while the second catalyst is set for mid-2019. If the data reporting is strongly positive as we expect, the company is most likely to be acquired by AstraZeneca to add more depth to its immuno-oncology pipeline. Dr. Hung V. Tran, M.D., M.S., C.N.P.R. is the Founder of Dr. Tran BioSci, Integrated BioSci Investing, and BioSci Capital Partners. As the Chief Medical Analyst, Dr. Tran pioneers a novel investment philosophy (Integrated BioSci Investing), a fusion of value and growth investing that are specifically adapted for bioscience business analysis. We leverage on Dr. Tran’s unique medical, scientific, and market expertise to deliver an unprecedented accuracy in clinical trial forecasting and in finding alpha bioscience investments. In our first year of operations, Integrated BioSci Investing is now adopted by a community of hundreds of stellar investors and nearly 20 thousand readers. Asides from everyday investors, institutions also seek our research and consulting. Disclaimer: Despite that we strive to provide the most accurate information, we neither guarantee the accuracy nor timeliness. Past performance does NOT guarantee future results. We reserve the right to make any investment decision for ourselves and our affiliates pertaining to any security without notification except when it is required by law. We are also NOT responsible for the action of our affiliates. The thesis that we presented may change anytime due to the changing nature of information itself. Investing in stocks and options can result in a loss of capital. Because we are not registered investment advisors, the information presented should NOT be construed as recommendations to buy or sell any form of security. Our research are best utilized as educational and informational materials to assist investors in your own due diligence process. That said, you are expected to perform your own due diligence and take responsibility for your action. You should also consult with your own financial advisor for specific guidance, as financial circumstance are individualized.